This is the most unusual smoking collectible set. 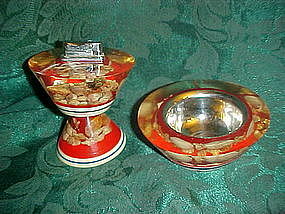 Made of a resin or lucite material cast with tiny shells and coral inside. Pretty red background really makes this set stand out. Lighter is removeable for refilling. Chrome insert in the ashtray has oriental lettering. The lighter sits slightly askew. It appears the base was not originally fitted correctly or it has been reglued where they join. Thus reflects the low price for this unique set. Lighter is 4" tall. Ashtray is 4 1/2" wide.